We know more about diet and health than any population in the history of the world. Yet most of us are overweight or obese. Why? According to the latest research, it turns out that many of us are literally addicted to food. Are you? Dr. Susan Peirce Thompson has developed a free quiz to help you find out how susceptible you are to food addiction. After the quiz, Susan will give you your score and a customized Food Freedom video to help you understand what it means for your life. How you respond to sweet, snacky foods is deeply linked to your level of susceptibility. In 2015, Dr. Susan helped people lose 43,00 pounds, and GAIN Food Freedom. 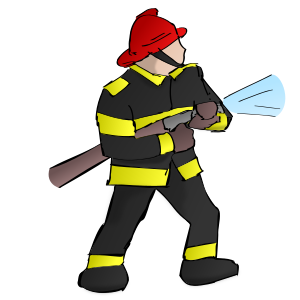 The first step is knowing how susceptible you are to the pull of addictive foods. Take her free quiz and find out how you score. 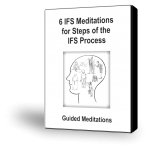 Guided meditations, which lead you through part of an IFS session, help you to access an Inner Champion, or other formats. Self-nurturing helps you create a positive state of mind. 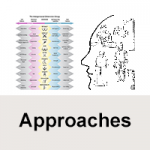 One of the practical benefits of the brain research information from the neuropsychology labs is letting us know that there are significant health benefits from having a positive state of mind. 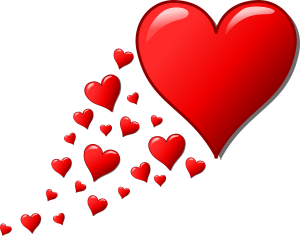 When we feel good about ourselves, hopeful about our lives, and deserving of love and support, this resets our cardiac system, helps regulate our emotional state, and creates increasingly satisfying experiences. 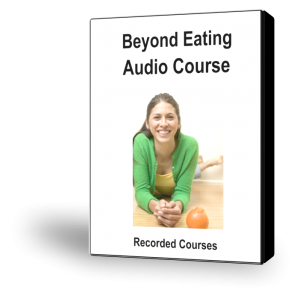 I have recorded this meditation as a delicious breath of fresh air for relaxing your mind and enlivening your soul and its innate possibilities. 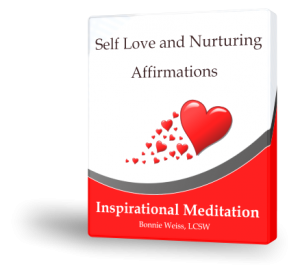 I invite you to receive these loving and nurturing affirmations before bed as a splendid evening treat. 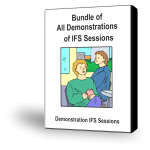 In our online store, we have many different audio products, including IFS Guided Meditations and IFS Demonstration Sessions. 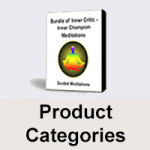 We have recently added a variety of new meditations and a few new demo sessions. In addition, we are now bundling together groups of meditations and demo sessions that naturally go together. This way you can purchase a bundle for less than you would spend if you bought all the meditations or demo sessions separately. In addition, we now have new technology in our store which makes it much easier to get these products with multiple audios. Instead of trying to download them, you can just log onto a part of the store where you can access your audios. From there, you can listen to any one you want or download it. You can log on as many times as you want to listen to or watch the products you have purchased. 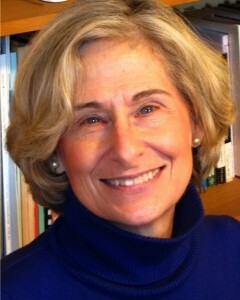 Dr. Marla Silverman is a consummate professional who specializes in work with couples. She is a wonderful teacher who embodies the groundedness, clarity, and openhearted wisdom that we all strive for. 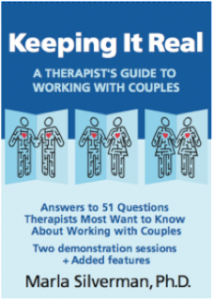 We are excited to be able to offer her new video on couples’ therapy, Keeping It Real: A Therapist’s Guide to Working with Couples in our store. This teaching is appropriate for beginning and experienced therapists as well for couples who are working on their relationship. We hope that you will take advantage of this opportunity at a 10% discount for a limited time. 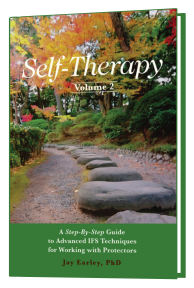 Marla’s video set is a fabulous teaching tool for beginning and experienced therapists. It is very well done. 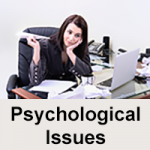 It is clear, professional, and addresses all the issues that a therapist needs to know to work with couples in a precise, personal manner. After watching it, I have found that my work with couples has markedly improved. I’m structuring the sessions a little bit differently and watching with more acuity. I am pleased to announce that many of the webinars I have taught are now available through our store inexpensively. And more will be added in the future. Problematic Attractions. Understanding how you might be attracted to people who aren’t good for you and what to do about it. Reparenting in IFS. For professionals. How to reparent an exile as part of the unburdening process. Advanced IFS Reparenting. For professionals. Advanced topics in IFS reparenting of exiles. Click here to read about or purchase the Webinars. 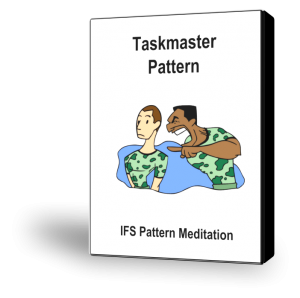 Our online store has had a number of recorded guided meditations that take you through the first part of an Internal Family systems Therapy (IFS) session, and now we have added quite a few more. Each guided meditation is designed to work with a certain pattern. You access the part of you that enacts that pattern, get to know it, find out what it is trying to do for you, and develop a trusting relationship with it. 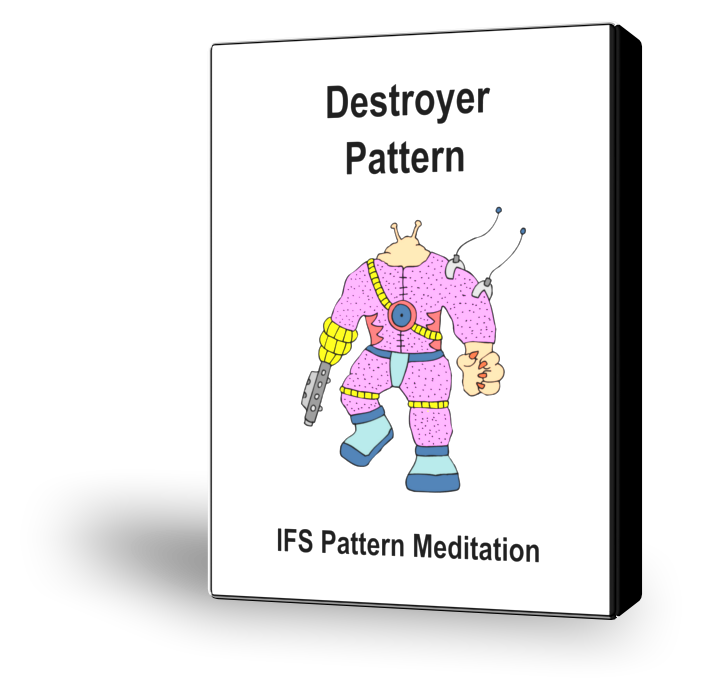 IFS has discovered that every part has a positive intent for you. This makes it much easier to connect with the part and help it to let go. In this meditation, you will discover the part’s intent and connect with it. This is a crucial step in transforming the pattern. 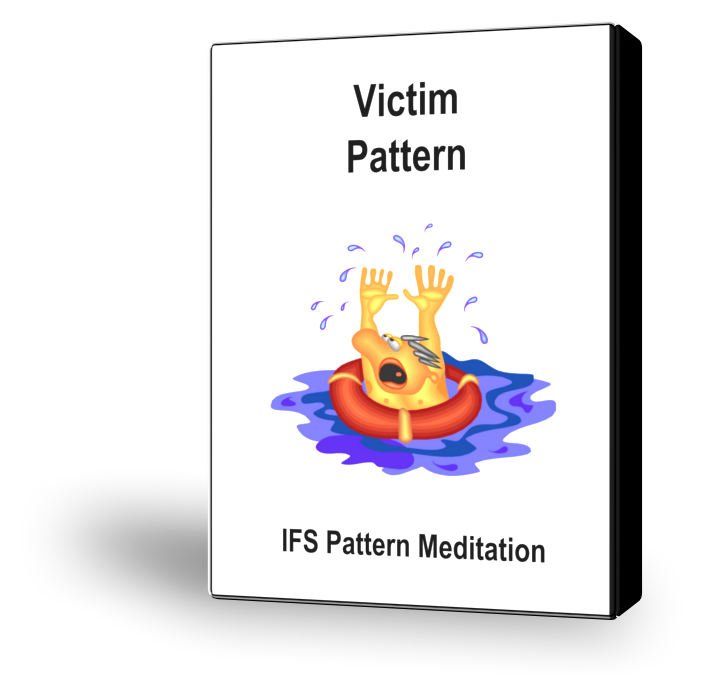 The Victim Pattern: If you have the Victim Pattern, you see yourself as being wronged by someone or in an impossible situation. In other words, you believe that your problems exist because bad things were done to you. The Taskmaster Pattern: If you have the Taskmaster Pattern, you have an intense focus on hard work or discipline. You may have this because you want to be successful and thereby gain the satisfactions of success—money, praise, power, freedom, or admiration. 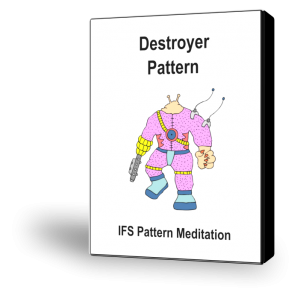 The Destroyer Pattern: The Destroyer makes pervasive attacks on your fundamental self-worth. It shames you in such a deep way that you feel intrinsically flawed. Click here to learn more about these and the purchase them.